okay, got all your stuff? 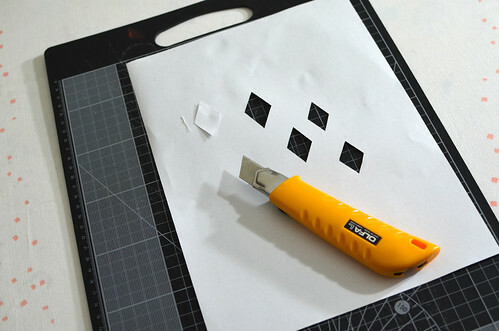 now you're going to sketch out your design on the paper and then trim it out with the knife (or just go all crazy and start cutting like i did), using the cutting matt or cardboard underneath to protect your work surface. you could also work up your design on the computer (in Illustrator or another drawing program) and print it out, all ready for cutting. your design does have some limitations because you can't have shapes inside of shapes (you know?) but this doesn't mean it has to be super simple like the diamonds i have done. check out the work of paper cutting artists heather moore and rob ryan and you'll see what i mean (to a rather extreme degree!). here is my finished design and my homemade screen, ready to print! ignore the marks on my screen, i was going to paint a big dot on it with screen filler and changed my mind. now grab your fabric (i used a super fine pinwale cotton corduroy) and position the paper where you would like the design to print. 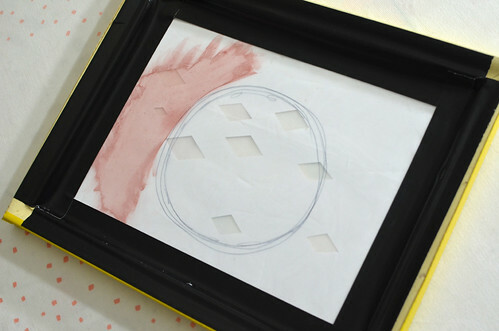 lay your screen on top, making sure that the paper is covering all open mesh around the edges. 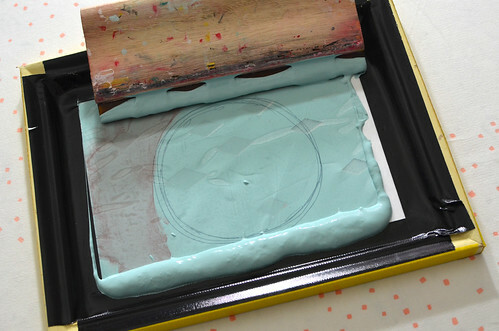 spoon your ink onto the screen and using fairly firm pressure, draw the squeegee across the screen. lift your screen up and voila! your design is nicely printed on the fabric and the ink magically adheres the paper to the screen, meaning that you can move the screen around and make multiple prints. when you are finished printing, simply peel the paper away from the screen, chuck it in the garbage and rinse your screen out in the sink or outside with a hose. dry it off and it's ready to print again with a new stencil! 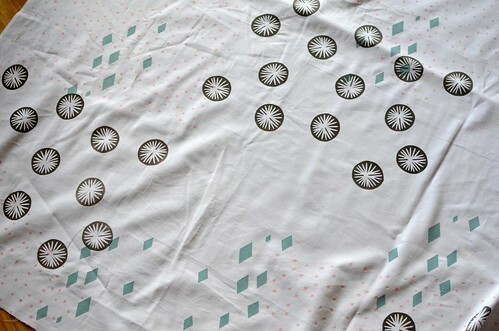 you can usually make around 10 - 15 prints this way before the paper starts to get too soggy so it's perfect for small things like t-shirts, pillowcases or say, a meter of fabric for your swap buddies? it's also a great way to test designs before going to the cost and/or trouble of getting a permanent screen made. i've enjoyed using it to muck around with overprinting lately and don't plan to stop any time soon - i hope you guys get the same enjoyment out of this super easy printing method. three colour overprinted cotton corduroy using two standard emulsion screens and the cut paper diamond stencil shown above. 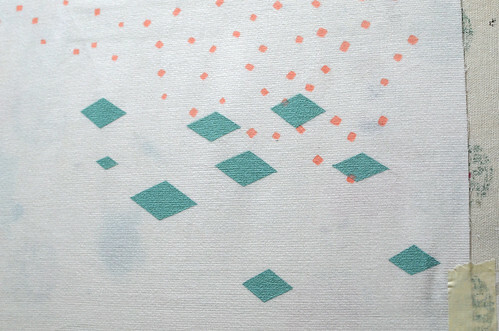 four colour overprinted linen tea towel using two standard emulsion screens, one screen painted with screen filler and a cut paper lines stencil. I love it, would you go to the store for me..I adore it actually, I will have to put this on a bucket list for 2013, I have so much going on right now. Do you sale these home made kits with some paint? :) thank you for sharing, I have wanted to do this, my mom thought I wanted to do jewelry and make paper ( I am 48) so she sent me the stuff, havent touched, but I am getting a craft area made for stuff like this and I just love it, I love your designs too..
thanks, shirley! 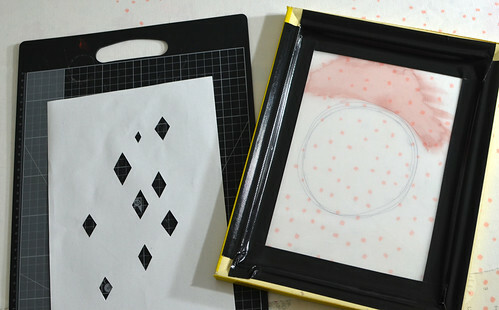 i don't have screen printing kits but you can pick up all of the supplies fairly cheaply at art supply stores or ebay. let me know when you get around to trying it out, i'd love to see! Thank you very much ! Very helpfull tutorial. What kind of ink do you recommend, Leslie ? i use permaset aqua ink and have found it to be great! That turned out beautiful, you've done a lovely job! 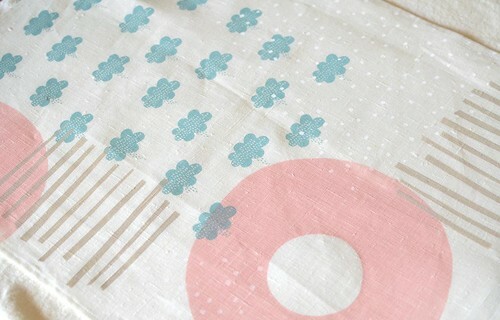 I have this linked to my DIY screen printing post too today, for inspiration! Laser cutting on this one is not necessary. T-shirt printing business is a good type of business. These stencil effects will make a lovely effect engraved on a business letterheads for my shop. Thank you for this lovely idea. Have you ever considered turning that into a business? Whether it's printed leaflets or full-blown banners, I'd bet you'd do really well at it. Interesting. I could use these designs to decorate and customize my pocket folders in the office. It'll be a lot easier for me to figure out which is which among them. I'm not really sure where to start with advice! I learned basic colour theory in design school 15 years ago and spent a lot of college time painting and mixing colours for my Illustration classes so it comes pretty naturally to me now. One tip for the muted tones I use it to start with white and add the coloured ink very sparingly, a bit at a time. And mix really, really well otherwise you will get chunks of the original inks smearing through as you screenprint - not great! This would be great for table cloths or maybe furniture covers. I do have unused cloth in our backyard so I will definitely try to emulate this coming weekend. would the same ink work with your hand carved stamps? Custom screen printing on fabric is fun because it allows you to design your own t-shirt for special events easily and inexpensively and you have done really a great work. Sort items since you get. After the research you will be able to change, reduce as well as insert the quotations as well as custom research paper writing service into the right spots as part of your cardstock, yet they shall be tapped out as well as saved. As being a previous Harvard University or college admissions interview panel member and also a Harvard move on me personally index , We've lots of within understanding of your Ivy League admissions progress. Thanks for the article. Once I tried out some online professional essay services. I was lucky to receive a well-written research paper on economics...So I would recommend using some external help in cases, your grades are on the line. Your post is incredibly exciting and especially effective this article is very supportive for our public your blog is amazing, I am waiting for you’re after that blog. Lovely article! Please, visit our website to get information on how to write excellent essays! Well, it is very interesting! This article contains valuable information! Hmm...I find it very Interesting anyway Best wishes from prime-essay! Fabulous site you have here. I enjoy it a lot. Carry on! write my essay for me Our writers who are able to buy papers, written by an experienced writer, will be delivered to you within the required time frame. Disclaimer: all works delivered by organisation writing service you will automatically: get assistance with papers of any types and formats: research papers, thesis papers, dissertations, admission essays, annotations, resumes, course works, dissertations, term papers, thesis papers, essays, dissertations and other custom writing services to suit all your academic needs. Writers out the penalty for submitting plagiarized work. If you are worried about our old apps and mobile wallets then click the above link and buy us apps and mobile wallets in cheap rates. Writing a great essay assignment is really a difficult sufficient task for anyone, and the assist you to can gain from article assistance is really a very helpful aid. Many brilliant scholars might be specialists into their own field but they lack article writing abilities, and there're not actually as good at placing across application essay help the theories since they are in researching all of them. It's very importent website with regard to simple composing document. Fantastic evaluation documents tend to be created to assist college students find out more about the particular books lots of people look at. Investigation documents are created to drive the particular college student to determine some kind of brand new utterly as well as to write my paper down in relation to numerous degree or even discussion within their selecting. Tkanks.